After thirty years, the Rebbe of Belz ordered to resume the practice and bring a player to accompany the choir • Which Hasidic melodies sung? • Who else plays the violin? 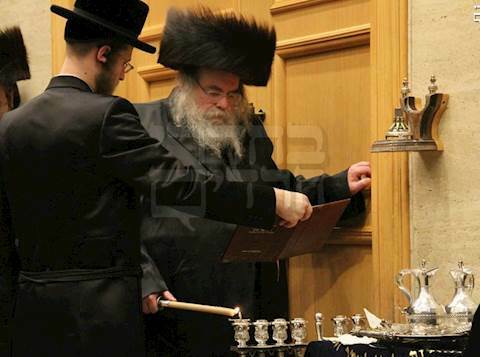 Belz renews the tradition this year: ten years since a musical instrument was not sounded during Hanukkah at the hassidus while songs were sung by the choir, after lighting of candles by the Rebbe, the Rebbe instructed this year to resume the custom and order a violinist to accompany the Belz Hasidim choir and singer Harav Yirmiah Deman while singing. In Galicia, and later also in the Holy Land, the custom was to be short with Mizmorim after lighting the candles. Besides "Haneros Halalu" and "Maoz Tzur" they used to sing only Mizmor shir Chanukas Habayis and "Tamnia Apei". In the years of leadership of the Rebbe various other mizmorim and prayers were added according to his instruction, for which composers attached to Belz composed different tunes over the years. Already about thirty years ago, the Rebbe instructed towards 'Zos Chanukah' that a violinist be added to the choir to accompany it during the singing. It was not a regular practice, and the few times that a violinist was commissioned in later years were done solely by the early instruction of the Rebbe. The only time the Rebbe is used to light right next to the time of lighting is on Motzaei Shabbos. This evening, immediately after the time of Rabbeinu Tam, the Rebbe made Havdola and then lit. A violinist arrived at the event and before the start of lighting played a "hisorerus nigun" – an old Modzitz tune. Afterwards, the violinist continued to accompany the choir throughout the event. They also played the well known 'Hamavdil' of the Chazan R' Yosale Rosenblatt z"l.
For the first time, the choir was accompanied by a wonder boy from the Pirchei Hassidus, called Bernstein from Ashdod, after 15 years in which there was no child singer in the Belzer choir. It should be noted that the choir under the direction of Harav Alter Meir Kalish, prepares for more than a month before Hanukkah. Each year, after the holiday, the Rebbe invites the choir members to his home and gives them Hanukkah gelt. This year the Rebbe exceeded his custom, and in appreciation of their investment - called them after the end of the event and gave them in front of the crowd special silver coins. It should be noted that the practice of playing the violin, is also common in the Kretshnif and Nadvorna dynasties, a practice from the head of the dynasty the Rebbe R' Mordechai Nadvorna zy"a, and all his offspring the Rebbes kept this custom, each night during Hanukkah. This melody was has holy roots, and is sung on the chapter of Tehillim, "Shir hama'alos le'David, hine ma tov uma naim". After the Rebbes and crowd sing this chapter, the Rebbes take over the violin and play the tune again. The Rebbe of Primishlan also has the custom of playing the violin which belonged to his father the Rebbe R' Dovid Moshe of Kretshnif zy"a, which he inherited.